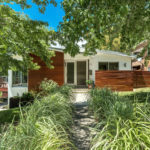 This five-bedroom, three-bathroom Oakview Estate property has great curb appeal, with bright mature trees, a winding footpath and an elegant painted door gracing the front porch. Completely remodeled, the home features classic Brazilian walnut floors, a brand new kitchen, bathrooms and inviting spaces to dwell all year round. The furniture pictured throughout the 2368-square foot home showcases the owners’ penchant for sleek and modern design. The furniture isn’t included in the sale but the stylish light fixtures are! A large saucer lamp hangs graciously in the entryway, while the dining room is aglow from the G. Nelson bubble lamp. The new and spacious, open concept kitchen is both sleek and warm through the use of mixed materials. Stainless steel appliances and sparkling quartz countertops contrast against earthy-toned open shelving, stunning timber flooring, tiled backsplash and double timber and glass pantry doors. The timber-framed picture window provides wonderful natural light, and is sure to compel domestic gods and goddesses to take to doing the dishes, simply for the view. The adjacent dining area provides a welcome transition from the kitchen to the pretty patio. The large glass sliding doors provide access to an outdoor sanctuary. Lush grass and mature trees , including a peach and pear tree (minus the partridges), offers respite and shade within a fully fenced and very private corner lot. The patio’s adjustable roller shades provide all-year protection from the elements. The home’s configuration would suit so many buyers , with three bedrooms located on the main floor, and two bedrooms downstairs adjacent to the family/entertaining room. The main bathroom showcases spectacular European styling with dark blue mosaic glass tiles, glass wall and pristine porcelain vanity. A clever fireplace design extends from one level to the next, providing a cozy mid-Century modern feel with brick and stonework. Curl up in the expansive carpeted family room downstairs or climb the staircase – elegant in its simplicity with hardwood beams and classic wrought iron balustrade, to bask in the feature stonework and timber floors upstairs. You needn’t worry about potential costly upgrades with this home as the roof was replaced two years ago, and new carpet was just installed in four bedrooms and the lower family room. The generously proportioned garage is officially deemed a ‘two-car’ garage, however, it boasts enough space to accommodate two vehicles and additional storage to store typical household garage ‘stuff’ while swinging a golf set or two. Come game day, your visitors will appreciate the wide and level driveway, easily providing for up to six vehicles, without having to resort to street parking. Located a stone’s throw away from picturesque Big Cottonwood Canyon, you will delight in the recreational wonderland offering biking, fishing, hiking, skiing and so much more within Utah’s spectacular countryside. This home is sure to sell quickly. Call Cathy TODAY to schedule your private tour on 801.244.5827.